•Friction tab inside the fir tree allows the tie to sit in mount without falling out prior to installation. •Fir tree provides low insertion effort yet demonstrates high extraction resistance. •Disc feature prevents rattling in high-vibration applications and protects against debris ingress. •Friction tab inside the fir tree allows the tie to sit in mount without falling out prior to installation. •Fir tree provides low insertion effort yet demonstrates high extraction resistance. •Disc feature prevents rattling in high-vibration applications and protects against debris ingress. 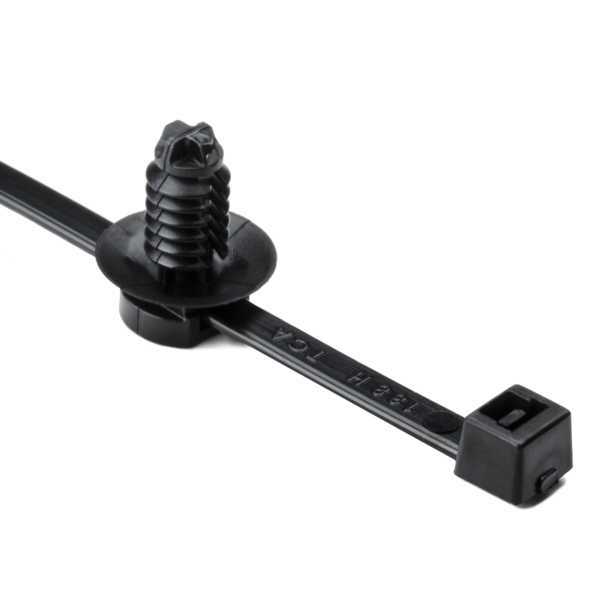 HellermannTyton’s fir tree mounts provide a secure grip in a mounting hole. The mount can slide along the cable tie to adjust orientation as needed. Fir tree mounts are designed to provide a low insertion force and high extraction force. This mount is sold as an assembly with the cable tie.